Saddle up for a wild ride, country fans. The OakHeart Country Music Festival is heading to town, and this year it’s expected to be bigger than ever. Serving a crowd of hundreds when it first started in 2012, OakHeart is now several thousand strong and boasts a lineup that covers every genre that falls within the country tent, including blues, bluegrass, Americana, folk rock, Southern rock and more. The Oak has grown mighty indeed. OakHeart founders Brian Hynes and Troy Hale (both longtime residents of Thousand Oaks) envisioned putting on a country music festival in their own hometown where the community could gather for live entertainment, cuisine and camaraderie. Today, the grass-roots effort that involves hundreds of volunteers has earned a reputation for its top-class acts that raise money for numerous local and national charitable causes. The first festival in 2012 brought about 800 attendees, and the fifth annual event on June 4 is expecting 6,000 guests. Local and national charities that will benefit include Manna Conejo Valley Food Bank, Meals on Wheels, K9s for Warriors, End Polio Now and other charities supported by the Rotary Club of Westlake Village. “All the proceeds go back to the Rotary Club and they are dispersed to local and national charities,” Hale explained. OakHeart has been bringing local and national bands to the Conejo Valley for four years now and donating its profits to multiple charities along the way, said Twyla Monti, who is part of the event’s public relations team. 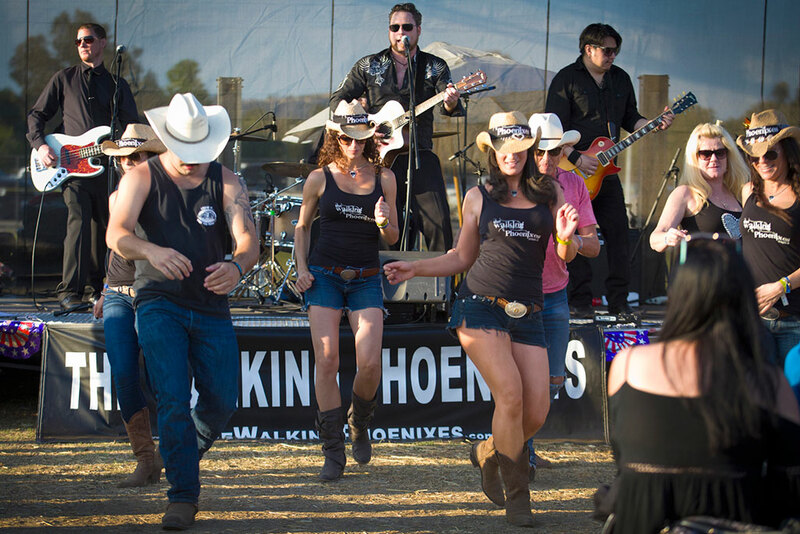 Line dance fans boot scoot to a performance by The Walking Phoenixes at OakHeart 2015. The festival at Conejo Creek South Park in Thousand Oaks will feature main acts Chase Bryant and Josh Thompson, who perform predominantly contemporary country music, as well as Rodney Atkins, known for the song “Take a Back Road” and the platinum hit “Farmer’s Daughter.” Acts donating their time to perform include Honky Tonk Boom Box, Ryan Bexley, Hannah Rose, Just Dave Band, The People and Rebel Heart. “People can bring their lawn chairs,” Hynes said. “It’s just like a concert in the park but instead of people covering amazing songs, it’s people that wrote them and will perform them.” Hynes added that Luners Production Services in Ventura donated a large LED video wall for the festival. “So people sitting in the back can see the show in front,” he said. In addition to raising money for charity, the festival brings revenue to Thousand Oaks due to its large number of attendees. “These are people who are filling our hotel rooms and bringing cash dollars to our city,” Hynes noted. Looking back on the tremendous growth of the country music festival, Hale credited the support of Harry Schad, a member of the Rotary Club of Westlake Village, who passed away in September of 2013. During the second year of the festival, when the event sold out with 2,500 guests, Schad attended the event despite his ailing health. The OakHeart Country Music Festival will be held on Saturday, June 4, at Conejo Creek South Park, 1300 E. Janss Road in Thousand Oaks. Gates open at 1 p.m. For tickets or more information, visit www.oakheartcmf.com.